For some strange reason this short film by François Truffaut popped into my head the other day. Les Mistons - The Brats - was one of his first directorial efforts, in 1957. It laid the groundwork for the adolescent themes in some of his later films. It's about five boys who quite fancy an 'older woman' and who subsequently get jealous when she takes a lover. No, this hasn't turned into a film blog, I'm including it here because the first 3:30 of the film is a beautiful woman on a bicycle. Skirts a'fluttering. As they have since the bicycle was invented - so feel free to giggle when somebody tells you cycling is only a 'sport'. That's why I call it Bicycle Culture 2.0 [beta]. We've all been there before and we're going there again. Regular people on normal bikes in everyday clothes. All over the world. And they weren't wearing lycra or riding carbon fibre contraptions and they weren't restricted to flat areas. 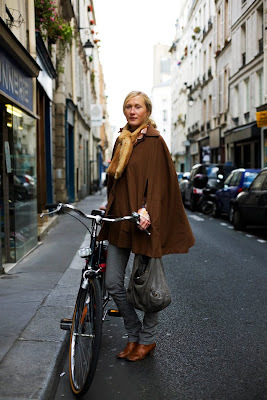 The Sartorialist - aka The Colville-Andersen on No Wheels - :-) posted a couple of lovely bicycle shots recently. The film above was shot in Nîmes and this photo is in Paris. Nothing French about this shot, I just like it. Taken at the new Royal Theatre - Skuespilhuset - on the harbour in Copenhagen. I draw the line at reading this blog in lycra. anything else goes. remember, this blog is aimed at all those out there who have been brainwashed into thinking that cycling is only a 'sport' and that in order to ride, 'gear' is required. we merely highlight the fact that most people in the world, and in history, never wear/wore 'gear'. And by highlighting that fact we're hoping that many people will be inspired to ride their bikes, as you already do, which is wonderful. The shot at the Royal Theatre is amazing. I would love to have that as my background image. Any chance I could get a high res copy? Do you post any wallpapers, or sell prints? @Brent- we could make you a lycra 'zakkaliciousness' team jersey that you could wear with a nice pair of cords! I am sure we all would approve. Mr. Bush was quoted today as saying 'It was wonderful to be able to cornate with Mr. Obama here in the White House'. crow molly, can you send me a mail at copenhagencyclechic at gmail dot com about the wallapaper? It would be most cornate of you to do so. Great imagery of a shoving match in the oval office. I love the internet. Ah, I'd been meaning to refer you to the Satorialist bike pics, but I see there is no need. I must also note that as much as I like pictures of lovely young women on bikes (and I like them a lot); it seems to be the older men in Milan who are the bike fashion leaders. In my city I see more and more people riding without lycra, gortex or any kind of teflon. This makes me glad! This is just more beautiful than lycra... and other "serious materials". Lycra or not.., as it was once said: "You don`t have to be against smth, You just have to be for smth else" . Lycra, gortex, teflon are promoted as the most comfortable materials for cycling, hiking, running and ctr . This is just an advertising idea for selling the goods. 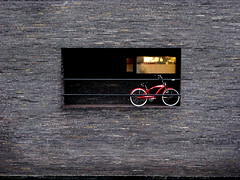 True cycle chic, that we are talking about, is a dress, dress shirt at least.. `Cause this is just beautiful. Just that.. I like it because the oblique angle of the shot actually gives the illusion that the left side of the photo is taller than the right side. you take prettier bikes pics than him, my dear friend! That's impossible! (at least according to some) That young lady in the movie was riding that ancient beast in a land with hills! i know, andy... must have been made with early green screen/cgi technology.